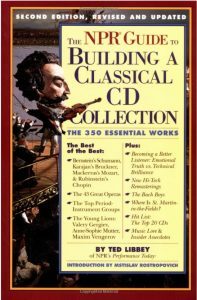 I have read numerous books, magazines and articles about classical music over the years, and here is a list of some of the reading material that I found useful or entertaining. This is one of the earliest books I purchased. Ted Libbey brings together most of the major classical works along with reviews of performances. Each work usually gets a nice history or explanation, and follows with one or two reviews of recommended recordings. Since the latest edition is from 1999, these suggestions tend to revolve around that time frame. While I found that the CDs he recommends are not on the top of my list, to be honest all of the suggestions are valid and worth getting, I just tend to like older recordings and his are of a more recent vintage. Like any book, there are good and bad things. When at the end of the book he discusses opera, it is like a race to the finish, with not nearly as much detail as with the earlier works. Also, of course there are missing works, but for what it is, this is an entertaining book that I have re-read and flipped through so many times it is ragged.